This entry was posted in Entrepreneurship and tagged algae, crowdfunding, drink powder, entrepreneur, entrepreneurship, food, independent study, indiegogo, kickstarter, nannofood, phytoplankton, product development, social business, social responsibility, westtown school on May 4, 2015 by zachsta18. This entry was posted in Entrepreneurship, Science and tagged algae, babson, babson college, business, college, dropout, entrepreneurship, gap year, independent study, nannochloropsis, nannofood, social business, social entrepreneurship, social responsibility, Westtown, world hunger on April 20, 2015 by zachsta18. Recently I went to Las Vegas to take part in the Thiel Foundation Summit, an event for young people who are working to change the world. This entry was posted in Entrepreneurship, Science and tagged algae, business, entrepreneurship, independent study, innovation, nannofood, phytoplankton, science, westtown school on December 4, 2014 by zachsta18. This entry was posted in Uncategorized and tagged art, business, Independent Seminar, independent study, literature, marine biology, nannofood, Westtown on November 13, 2014 by annekatherineb. At the end of the first two months of school, I have made adequate progress. However, there is still much ahead. This entry was posted in Entrepreneurship, Science and tagged algae, entrepreneurship, independent study, marine biology, nannofood, phytoplankton, science, westtown school, world hunger on October 27, 2014 by zachsta18. This week I have been looking at a new growth formula for phytoplankton. 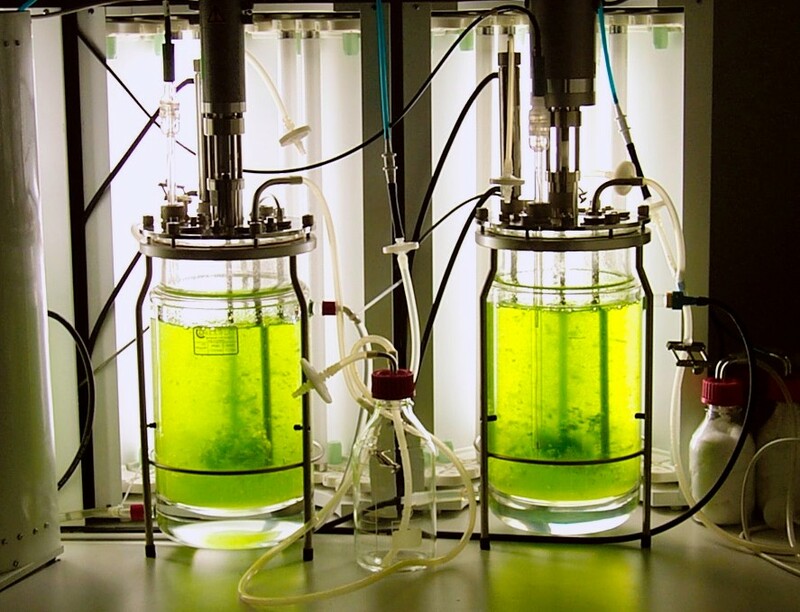 Phytoplankton photobioreactors growing green water. The most common growth formula for growing phytoplankton is called Guillard’s F/2. It is easily found online, and in most studies where growing phytoplankton is necessary, this formula is used. This is largely because it’s tried and tested- it works for a variety of different groups of algae, has been used for decades, and is cheap enough. About $20 of the formula will produce 10,000 liters of green water, or water saturated with phytoplankton. It seems like a great deal because for research, it only costs a fifth of a penny per liter. The problem arises when consider that 400 liters per day per person must be harvested, which equals about eighty cents. It seems menial, but for a family living under the global poverty line, living with under $1.50 per day, eighty cents is a significant cost. Additionally, Guillard’s formula is not as easily accessible in developing countries. If you want to take a look at the composition of Guillard’s F/2 formula, you can check that out here. The main goal is to find a nutrient formula composed of more accessible and cheaper compounds. I have recently stumbled across an article from scientists in Israel that have looked into and developed a nutrient formula using compounds found locally in Israel used commonly as fertilizer. Just by sourcing these products on Amazon.com, I have found that this formula is around half the price, just over $9.00 to produce 10,000 liters on a consumer scale. On a wholesale scale, moving thousands of times more formula, it should hopefully not be too difficult to arrive at under $5 per 10,000 liters, or under 20 cents per person per day (plus the cost of rice). These chemicals are also much more accessible in the target locations. Now that the growth formula has been established, we are ordering the required chemicals and are going to expand our cultures with the new formula. Once we have let the phytoplankton reproduce a few times in the new culture formula, we will be able to begin analyzing the nutritional composition of our phytoplankton. This week, my quote is from Howard Thurman. It is something that is constantly going through my mind. I first heard this class last year in my Business and Society class before the idea for Nannofood came, and it has definitely shown me that Nannofood is something I need to at least attempt to carry out. Not only is it something the world needs, but it is something that really makes me come alive. This entry was posted in Entrepreneurship, Science and tagged algae, business, come alive, entrepreneurship, f/2, growth formula, guillard, guillard's f/2, howard thurman, independent study, nannofood, nannofoodgigaproblem, nutrition, passion, phytoplankton, thurman, world hunger on October 12, 2014 by zachsta18. This entry was posted in Science and tagged #learning, algae, dreams, food, nannofood, science on October 6, 2014 by lukebley2014. This week, I will be explaining the business model for Nannofood. Because the target market is underdeveloped and impoverished areas, the production and distribution model make waves in terms of the feasibility of the project. This entry was posted in Entrepreneurship, Science and tagged algae, entrepreneurship, independent study, nanno, nannofood, nannofoodgigaproblem, phytoplankton, science, westtown school, world hunger on September 28, 2014 by zachsta18.